BORDEAUX got it right when it came to public transport. Just three euros per day on the tram system during Euro 2016. At Grand Parc station we bumped into an artist who was taking her painting of a ball disguised as a globe to an exhibition. She was hoping to find a buyer. “Bonne chance,” we said as she got off with her huge canvas. It was Tuesday and the town centre was buzzing. At 10am, Austrians were dominating the bars and cafes, quaffing Heineken at a special Euro 2016 price of EUR 5 for a large plastic “glass”. Rousing drinking songs echoed from the pavement cafés, getting louder by the round. They seemed to outnumber the Hungarians 3:1. As we walked across the Pont de Pierre, which spans the river Garonne, we were enveloped by a band of Austrians waving their flags and marching in single file. “We are from Linz,” they shouted. “But we like Arsenal”. The power of the Premier. We also bumped into a group of Scots, in smart national costume and ironic t-shirts – “Scotland…France 2016”. The tram ride to the stadium was sweaty (Bordeaux, intermittedly raining, hot and humid, seemed to be the town that deodorant forgot) and noisy, with two sets of fans trying to outshout each other. It was all good natured, a marked contrast to the events of the weekend in Marseille when two sets of imbeciles tried to outpunch each other. The stadium came into view. We had caught a glimpse of it from the aircraft as we came in to land and it was quite striking. Close up, it was one of the most eye-catching football grounds around. 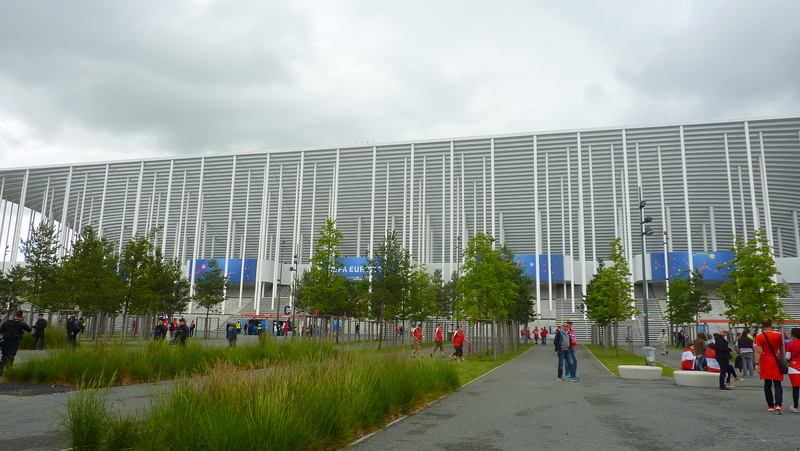 The Nouveau Stade de Bordeaux, now called the Matmut Atlantique, was opened a year ago. Designed by Swiss architects Herzog & de Meuron, it has received a lot of attention, and rightly so. This company has an impressive book of work, including the Allianz Arena in Munich, Tate Modern in London and the famous “bird’s nest” Beijing National Stadium. They are also set to build Chelsea’s new stadium at Stamford Bridge. I was looking forward to seeing this stadium and was not disappointed. Strikingly white – shiny white in places – it is framed by 900 columns and has a rectangular roof. It’s classical, minimalist, nautical and geometric, all rolled into one. What a place to watch football every fortnight! It’s like a giant lightbox sitting on the edge of Bordeaux. But first we had to get in. Security, we expected, would have to be tight and the searches were quite invasive. I almost expected a latex glove to be included. But somehow, and worryingly, Hungarian fans managed to get flares into the ground. It does not bear thinking about where they might have hidden them! The acoustics inside were good, allowing UEFA the chance to fill the stadium with the thump-thump music that nobody really wants. At least the crowd did not have to suffer David Guetta, who failed to illuminate the opening ceremony in Paris. It is slightly patronising the way major sporting events attempt to produce “games for the masses” by introducing singalongs and competitions to see who can shout the loudest. And where did this “countdown to kick-off” come from? Memorandum to UEFA – football is not Disneyland. Before the game started, the fans were engaged in some form of national ditty – both of which seemed to be leftover from the Eurovision Song Contest. But once the teams were on the field, the real passion came out in the Austrians and Hungarians. The Austrians were waving around what looked like silver paper, while the Hungarians were having none of that. There was an interesting mix of irredentist banners that included a pre-WW1 view of the Hungarian empire. The Magyar crowd was throaty and mildly intimidating and there seemed to be a lot of black t-shirts in attendance. According to the UEFA-run shouting contest, Austria were louder. At least at the start of the game. Before kick-off, Austria and Hungary had met 136 times, with Hungary winning 66 and Austria 40. There was a time when both were leading lights in European football, but the map has been redrawn several times since then. Austria almost went ahead after less than 30 seconds when David Alaba struck the woodwork with a shot from 25 yards. Hungary’s 40 year-old keeper, Gabor Kiraly, dressed in unseasonal tracksuit bottoms, didn’t see it. Austria started the more confident side, but generally, the passing was a little wayward from both sides. You sensed, however, that Hungary had a bit of game plan. And so it proved. Hungary’s veteran midfielder Zoltan Gera (37) was key in midfield, not only spraying the passes around but also doing a shift in defence. In the 62nd minute, Hungary stunned their Danubian neighbours with a goal. Adam Szalai controlled a long pass, worked a little move with László Kleinheisler and then slid the ball under Robert Almer, the Austrian keeper. The crowd went berserk behind the goal, with the players embracing fans and likewise. A couple of flares broke out among the crowd. Hungary’s case grew stronger four minutes later when Austria’s Alexsander Dragovic received a second yellow. Österreich went in search of an equaliser, but there was always the chance that Hungary could hit them on the break. Three minutes from time, Zoltán Stieber did just that when ran on to a through pass from Tamás Priskin and chipped the ball over Almer. More jubilation from the white-shirted players and black-shirted supporters. It wasn’t difficult to get a tram back. Austrians were streaming out of the ground, their mood as dark as the architecture was white. The Hungarians were going to enjoy the moment and an hour later, they were still coming back from that wonderful stadium. It wasn’t a great game, but for the Magyars, it was a notable achievement. They hadn’t been in a major competition since 1986. The win, against their old rivals, sparked off celebrations in Budapest, but for one night only, Bordeaux belonged to Hungary. And you couldn’t help being pleased for them.